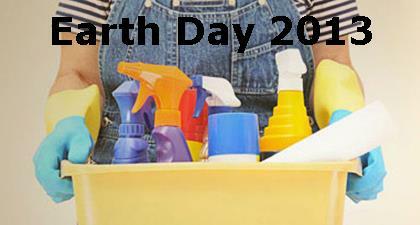 You are here: Home / Earth Day / What Are You Cleaning With and is it Safe for Families? What Are You Cleaning With and is it Safe for Families? Ever wonder whether your green cleaners are actually green? Unfortunately, you can’t just check the label to find out what’s in the products under your sink or in your laundry basket. So as we all gear up for some spring cleaning, the Environmental Working Groups (EWG) wants to make sure we’re not actually making our homes more toxic by spreading around the plethora of nasty ingredients that are in some of the most popular cleaning products. It’s no surprise that many household cleaners contain toxic chemicals linked to asthma, cancer, skin irritation, and more. What is shocking is that for most cleaning products there is no federal law to make sure the labels tell you what’s in them! So you often have no way to find out if your cleaners have harmful ingredients. You have a right to know. That’s why you need to check out EWG’s just-updated Guide to Healthy Cleaning. They rated more than 2,000 home cleaning products on the health risks posed by their ingredients and the transparency of their labels. They added nearly a hundred new products, including a whole new category: laundry pods. They have also included more information on allergens — including botanical oils that are known to trigger allergies. Click here to see if what are you cleaning with is safe. Click here to see how your cleaners rate in EWG’s updated Guide to Healthy Cleaning.